I speculated that the first Interplanetary Transport Ship could, with a Kerbin Orbit Rendezvous flight plan, make a trip to Duna, the Kerbol equivalent of Mars, and back. The trick is to dock two ships in low Kerbin orbit, transfer fuel to one, and then use whatever fuel is remaining in the second ship to boost two-ship combo towards deep space, into a highly-elliptical orbit of Kerbin. Another necessary technique for interplanetary travel is aerobraking: using the atmosphere of a planet (or moon) to slow you down, instead of rockets and fuel. It's a pretty complicated aerodynamics problem to figure out how deep into the atmosphere to go to reduce your speed by a desired amount. One option is to take multiple shallow passes, reducing your speed little by little, orbit by orbit. But what if you are attempting aerocapture: braking enough to be captured from a hyperbolic escape trajectory into a planet's orbit. There, you get only one chance. Too much and you are crashing to the surface. Too little and you are skipping back off into space. 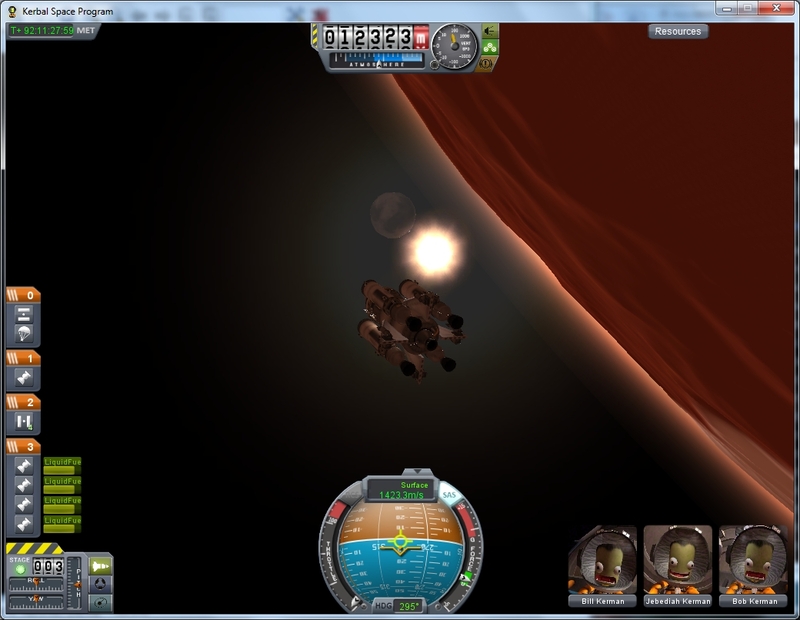 Arriving at Duna on a hyperbolic flyby trajectory...set up for an aerocapture. It turns out that there's some relatively simple calculating that one can do using only parameters readily available in KSP. I found this in a paper and presentation on aerobraking from an academic conference. There's still a lot of maths involved, but I arranged the important equations into a simple spreadsheet. 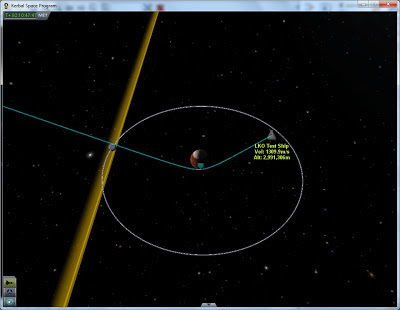 Enter the current orbital data (speed and altitude) and the aerobraking altitude at periapsis (closest approach) for a particular body, and it will calculate the exit orbit. But does it work? After trying it out a few times on Duna and Kerbin, I can say for sure that that formula works. If you use the pre-aerobraking periapsis, the output orbit will be somewhat less energetic than predicted (lower apoapsis), but I think this is mostly due to the slight reduction in periapsis that occurs at the front end of the aerobraking pass. If you use the true periapsis from the middle of the pass, the result should be even more accurate. Of course, that's not useful for mission planning, so a more practical tip is just to leave some margin for error by targeting a higher exit orbit than you really want. The simple formula works for hyperbolic escape trajectories as well (possibly even better than for elliptical orbits, since the predicted periapsis is not going to change much when you enter the atmosphere on such an energetic, straight-line path). So, for aerocapture it's a very useful tool. Something from real-world rocket science is actually applicable to KSP! That was probably the most exciting KSP discovery for me yet. 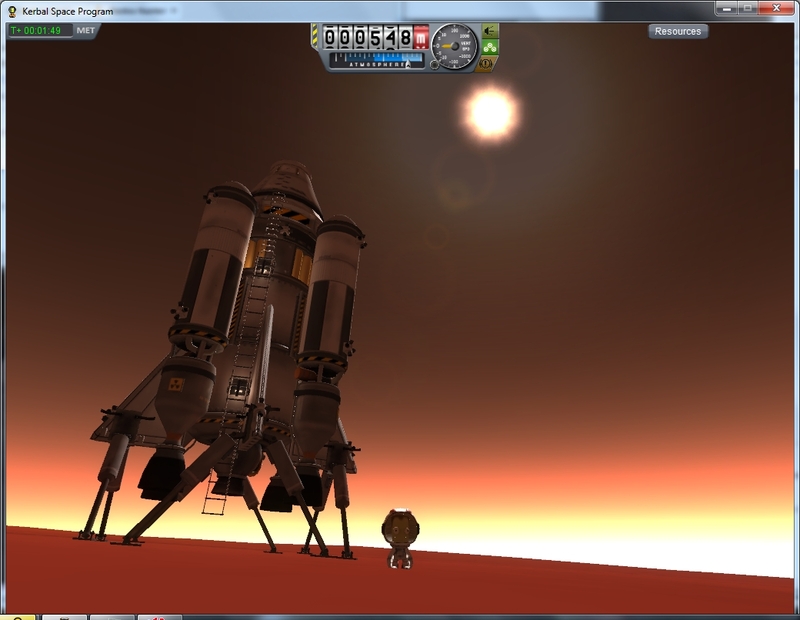 And it allowed me to get to low Duna orbit with essentially a full tank remaining. Getting down to the surface of Duna is, without a doubt, the hard part. The deorbit and powered descent took, in total, 2,059m/s of delta-v (the most convenient metric of propulsive effort, since it is independent of the mass of a craft). 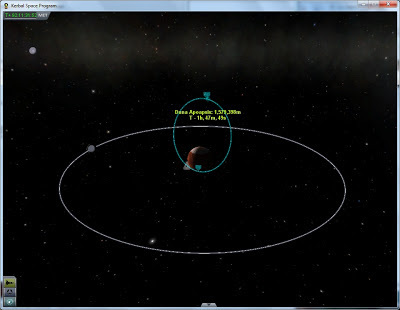 Though it didn't exist at the time, the official delta-v map of the Kerbol System suggest an ideal Duna landing from low orbit can be done on about 1,380m/s of delta-v, which I believe, since my landing was far from ideal. The ascent was much better, clocking in at 1,532m/s, plus an additional 110m/s for inclination adjustment to get in plane with Kebin's orbit for the trip home. You'll also note the change in aspect ratio, indicating I can finally run KSP on full 1920x1080 on my new laptop! This ship is built in v0.20 of the game, which has several new additions such as solar panels, new engines, and reentry effects (visual only, for now). It's almost the same ship, and the launch booster is in fact identical, but there are subtle differences to the transport ship (what you see above) that make it much more capable than the last. The main difference is that two of the LV-N nuclear engines have been swapped out for LV-T30 liquid fuel engines. (Both engines use liquid fuel...the LV-N is much more efficient but also has much lower thrust.) This opens up the possibility of high-thrust ascent. 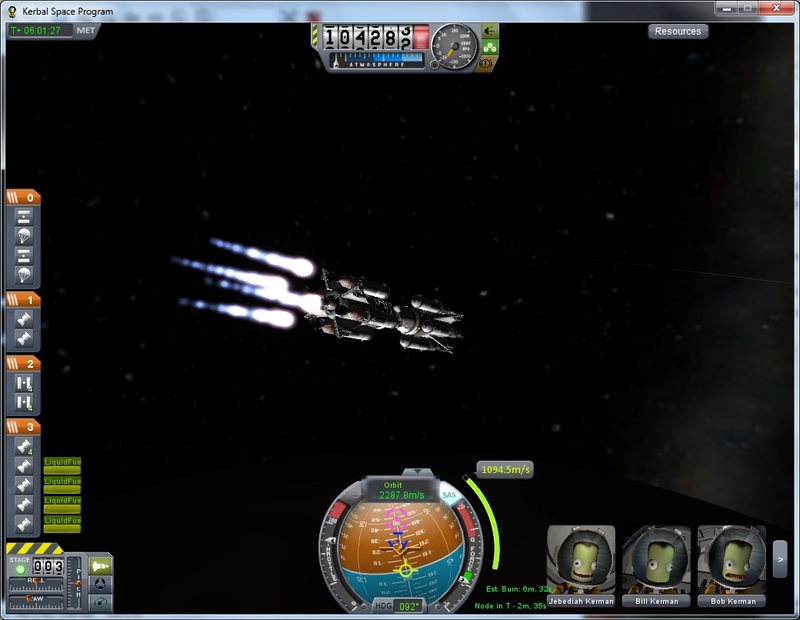 The ship can even, just barely, lift off from Kerbin. (It would not be able to reach orbit, I don't think.) More interestingly, it has a comfortable thrust margin for lifting off from Laythe, the only other inhabitable body in the Kerbol system. Yes, this ship is designed for a round-trip mission to Laythe, just as the last was designed for a mission to Duna. A Laythe mission would require very careful planning, and mostly likely both Kerbin and Laythe Orbit Rendezvous for refueling. (A total of three ships? Maybe even more.) And a completely powered descent to Laythe is pretty much out of the question - it will have to be parachute-aided. 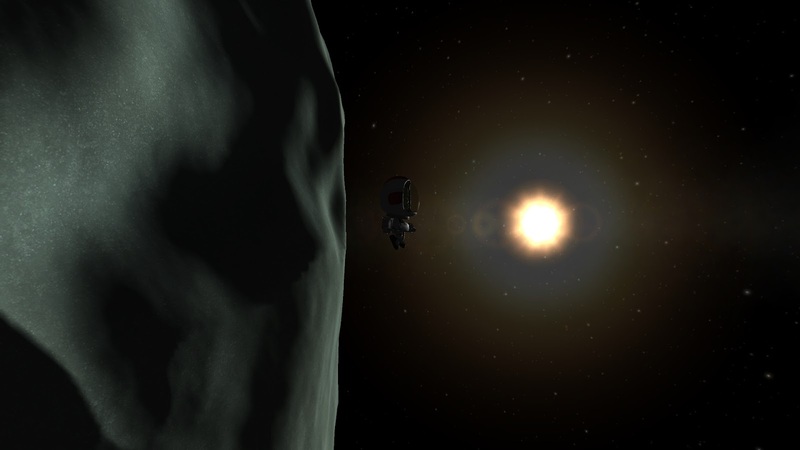 This is difficult since there isn't much land to target on the watery Kerbin-sized moon. However there's no fuel to waste tweaking the entry; almost an entire full tank of fuel is required for Laythe ascent, I think. 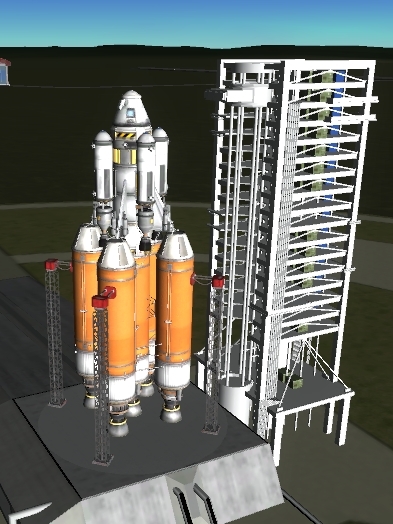 It will be much, much harder than the Duna mission, but I think a relay team of these ships is capable of pulling it off, now that the problem of Laythe ascent stage has been solved by swapping two engines for ones with more thrust. 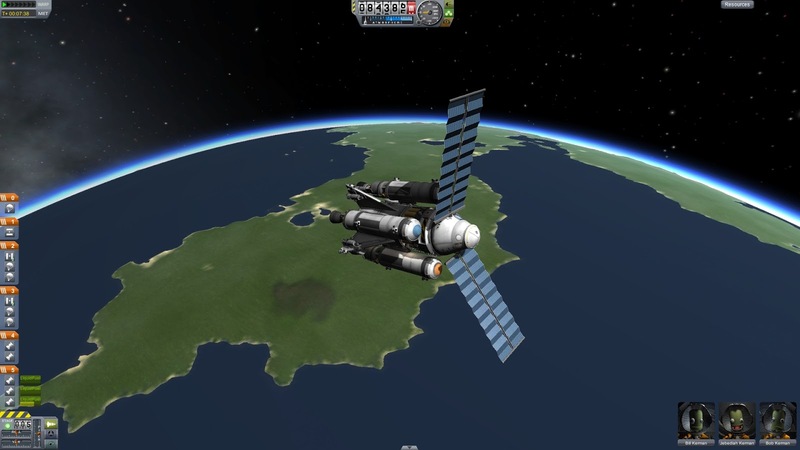 Two ITS2 ships dock in low Kerbin orbit. One is maxed out on fuel. The other is used to boost the first into a Jool transfer orbit, or as close as possible to one. (The primary ship can finish off the transfer burn.) The boost ship returns to Kerbin. 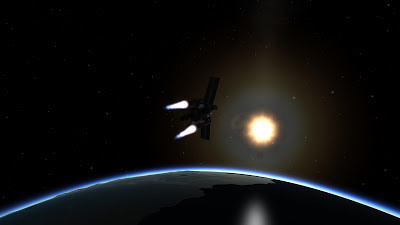 The first ship to Jool aerobrakes into an orbit that intersects that of Laythe. (Basically recreating this scene from 2010.) 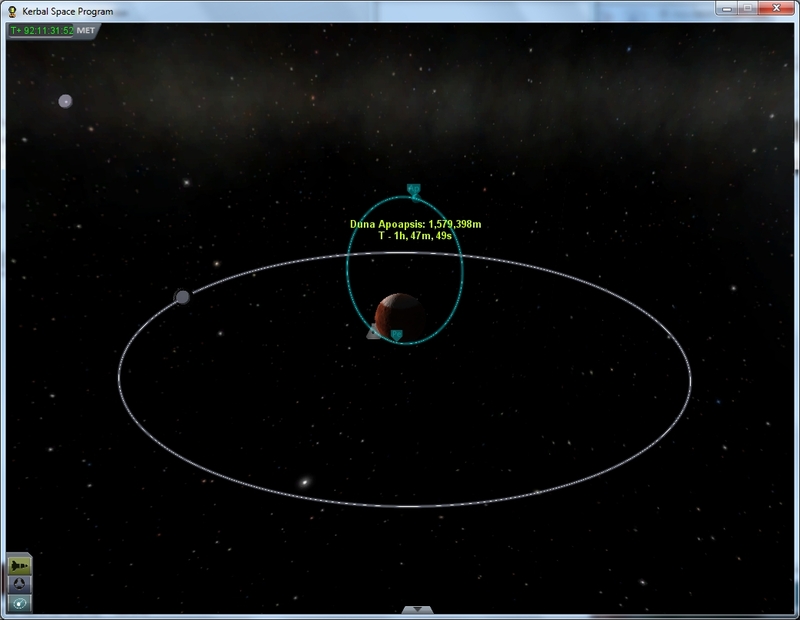 It then aerocaptures into Laythe orbit. All using minimal fuel. Repeat steps 1 and 2. 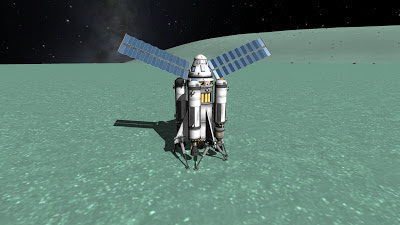 A second ship is now in Laythe orbit. The two execute a first Laythe orbit rendezvous. 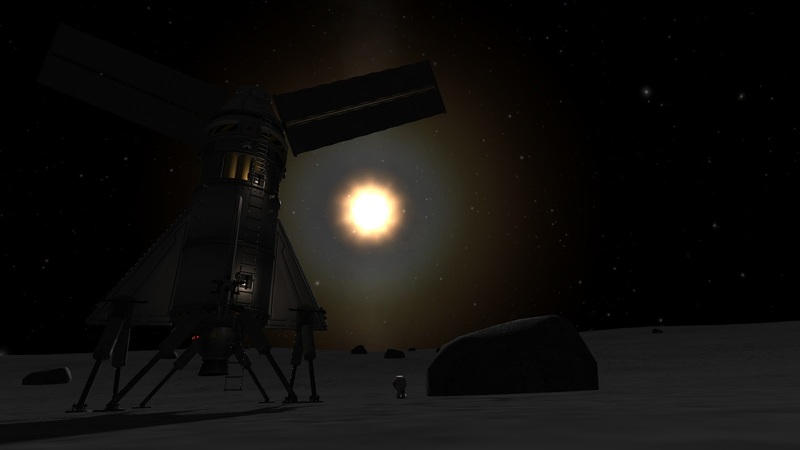 The lander ship (either of the two) is refueled. Lander ship decouples and deorbits, landing on Laythe with the aid of parachutes. This is the trickiest operation, since there is very little land mass to aim for and almost no fuel can be wasted for tweaking the descent. Only a small burn at the end to slow the craft to landing speeds should be necessary. 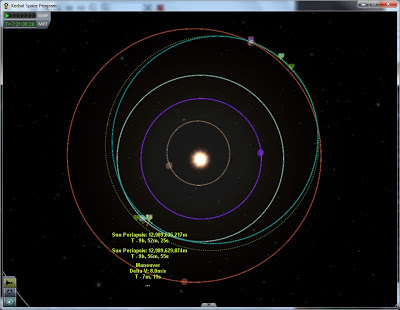 Lander ascends, using most of its fuel to get into Laythe orbit and re-rendezvous with the orbiting ship. And my first landing on Minimus. Engines: 2x LV-N, 2x LV-T30, 1x Rockomax "Poodle"